The need to construct bridges that last longer, are less expensive, and take less time to build has increased. 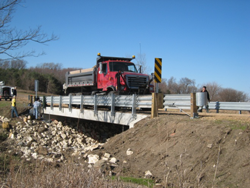 The importance of accelerated bridge construction (ABC) technologies has been realized by the Federal Highway Administration (FHWA) and the Iowa Department of Transportation (DOT) Office of Bridges and Structures. This project is another in a series of ABC bridge projects undertaken by the Iowa DOT. Buena Vista County, Iowa, with the assistance of the Iowa Department of Transportation (DOT) and the Bridge Engineering Center (BEC) at Iowa State University, constructed a two-lane single-span precast box girder bridge, using rapid construction techniques. The design involved the use of precast, pretensioned components for the bridge superstructure, substructure, and backwalls. This application and demonstration represents an important step in the development and advancement of these techniques in Iowa as well as nationwide. Prior funding for the design and construction of this bridge (including materials) was obtained through the FHWA Innovative Bridge Research and Deployment (IBRD) Program. The Iowa Highway Research Board (IHRB) provided additional funding to test and evaluate the bridge. This project directly addresses the IBRD goal of demonstrating (and documenting) the effectiveness of innovative materials and construction techniques for the construction of new bridge structures. Evaluation of performance was formulated through comparisons with design assumptions and recognized codes and standards including American Association of State Highway and Transportation Officials (AASHTO) specifications.